Not posting on my blog for over a month and missing My French Fridays with Dorie recipes inspired me to pick a recipe out of the book that works beautifully for Thanksgiving and makes me feel like I’m back in the saddle after a much needed break from the world of blogging. I have a lot to be thankful for and my blog always reminds me of that. I’m thankful that I have a blog to come home to- even a neglected blog can be brought back to life especially this time of year when we’re all excited about celebrating the holidays. I’m especially thankful for my family, I can’t wait to bake and share a batch of Bubble Top Brioches with them at Thanksgiving. They really are easy, fun, rewarding to make and one substantial dinner roll to round out a Thanksgiving feast. I’m the Paris lover in the family but can always bribe my husband Scott with any number of treats to get him on board for a visit. Last time we visited Paris we stayed in the Marais and loved both the area and our hotel. So, this trip we decided to stay in the Saint Germain des Pres area in the 6th arrondissement and make that our base of operations for the weekend. We loved the location but not our hotel so next time we’ll head back to our favorite in the Marais which also offers the added benefit of being close to Scott’s favorite place to eat in Paris. The Place des Vosges is the oldest and I think the most beautiful square in Paris so you do a little walking to get there from our hotel across town. It’s always good to work up an appetite in Paris especially when the scenery is so pretty and there are Scott’s favorite Parisian fallafels at the end of the trail. Once in the Marais we headed over to our favorite fallafel stand to take our lunch in hand and savor every bite. Did I mention that this is Scott’s favorite place to eat in Paris? Totally worth the wait on a Sunday afternoon, about 20 minutes. Yum, I love the roasted eggplant slices they put on top, they disappear quickly! I should also mention that a box of macarons from Dalloyau is my favorite dessert in Paris. Especially these giant size ones which are really great for sharing but very expensive even when enjoyed on a park bench. The flavors were chocolate, pistachio, raspberry and caramel. Happy Thanksgiving everybody, I hope you enjoyed a few of our favorite memories of Paris as well as some pictures of my new favorite Bubble-Top Brioche rolls for a holiday dinner. The recipe for Bubble-Top Brioches can be found in Around My French Table by Dorie Greenspan or by following this link to Dorie’s recipe at Epicurious.com. Be sure to fit your stand mixer with the dough hook as called for in Around My French Table to beat the brioche dough. Also, make sure to do an extra good job buttering your muffin cups as the rolls have a tendency to stick in the pan after baking. 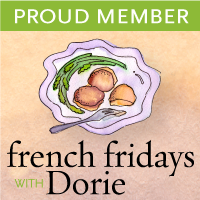 I just linked this post up to French Fridays with Dorie’s make your own choice from Around My French Table. Please check out the other linksin this Thanksgiving weekend potluck of recipes. These rolls looks divine. So glad you shared all the tasty tidbits of your trip with us. Even though I'm still crying because you didn't bring me. I missed you. Ok, you convinced me. Actually I DVRed an episode of Martha Bakes and she made these! And yours look so awesome. And thanks for the Paris cliffnotes. I haven't visited since 2001, and I am thinking, it is time I made my way there. By the way, thank you for playing with my emotions for showing the photo of the macaroons (swoon!) Have a wonderful Thanksgiving also! I have never been to Paris, but hopefully one day will get the chance. Your beautiful photographs will have to tide me over until then. Your Brioche rolls are gorgeous and perfect for Thanksgiving! Was that the falafel place in the 4th quarter? I was their just in August joining a huge line of people waiting for those amazing falafels, they were amazing! It looks like you're having a fabulous trip. These bubble top brioches look so happy popping out of their tins in a perfect little triangle of yummyness! Enjoy all this good food! Patty your brioche bubble rolls are beautiful. I have to make these. I always make popovers as requested by my family for Thanksgiving but will put these on my list to make during the holidays. I know what you mean about blogging. I love it and have made so many wo ferrule friends through it but so many friends through it but sometimes you need a break or just need to get work done. This month of November and December are so busy for me that I won't be able to devote much time to it. I'm hoping all my readers will still be around. I've only been to Paris once and stayed on the right bank I believe just next to the American Embassy and it was wonderful. I look forward to returning someday soon. Your flair for beauty and inspired recipes has truly been missed. Loved this post. Besides those scrumptious looking brioches…the Paris captures brought me back. BTW…St-Germain area vs. Marais…I personally prefer the latter also. Actually, the last time we were in Paris, we stayed nearby the Luxembourg park which was lovely as well. Hubby and I can't wait until we take our next trip there. Can't wait to read about the rest of your adventure. Love the pictures of Paris – maybe someday. Sigh. GORGEOUS and so glad to see you back again! As always, you inspire me to try things I haven't tried before. Whodathunk Paris would be such a prime spot for fallafel/falafel?! I love it, too. Happy Thanksgiving to you and yours, dear friend! Patty, I love those clover brioches. … so pretty. Beautiful photos! It looks like you had a wonderful trip. I haven't been to Paris since I was 13 years old, I really need to plan a trip to see the city through adult eyes. The bubble top brioches look great. I hope your family enjoys them, and that you have a great Thanksgiving! Blog breaks are a necessary part of this exercise in my opinion. In fact, there are quit a few out there I wish would take more breaks. (ba da bump pump). But what a RETURN! Baking bread is just something I have so far refused to do on The Big Day but these have me seriously considering it. Oh Patty, thank you for taking me away, even for just a moment, to the beauty of Paris. How lovely, and I'm glad you had a little respite. I just adore these bubble top brioches – they are a feast for the eyes. Happy Thanksgiving to you and yours So thankful to have met you! Patty – these look so tasty and I especially loved going to Paris. It has been 13 years since I was last there – need to go again. Hope you are doing well and perhaps we can get together soon. Happy Thanksgiving to you! Your brioche rolls look just perfect. Thank you for sharing your sweet treats and words my friend. No better way to end my weekend. I'm even more excited about my trip to Paris this spring! I hope you have a week full of family and feasting. Blessings from Austin! OMG Patty-for weeks now, I have noticed that you haven't been blogging, figuring that you are busy with family, work, and life in general…otherwise we would probably have heard about something else. Well, that something else, a weekend in PARIS?…Too much! …and here I was, in your area, while you were away in Paris? Wow! so, so, exciting! For sure, we have to plan ahead for next year to meet up in SF, hopefully you will join the Blogger Festival next year. Love, love, your gorgeous bubble top brioches, photos of them are way too beautiful, and can only imagine the delicious taste…so, perfect! Thanks for sharing your amazing Paris photos, so real, and so exciting! Glad you had a marvelous getaway! Welcome back, Patty! I've never been to Paris, but it's definitely on my list of must visit places. Sounds like you had a wonderful time and enjoyed some great eats. Hope you'll be writing more about your trip. You're a kind soul, Patty. I usually try not to put the words macarons and sharing in the same sentence…teehee. Your bubble-top brioches look perfectly gorgeous and wonderful for the holiday season. I've actually never had one before. It's great to have you back. Thank you for sharing your beautiful pictures and your trip with us. Happy Thanksgiving to you too, Patty! These brioches are as beautiful as the Paris photos! Awww, I miss Paris..I haven't been blogging for almost a month too haha. I see you had a great time here..So glad for you!! Hi Patty, Thank you for visiting my blog. Your brioche bubble rolls are gorgeous and I love all the pictures you've taken, so beautiful. So glad you had a great time in Paris–can't wait to return–the sooner the better! The bubble-top brioches would be perfect on any Thanksgiving table. Must really open up that book and try a recipe or two. Welcome back!!! Thanks for sharing your Paris memories – I can't wait to see more from your trip. … clearly you were inspired, just look at these brioches. They are perfection. It's my dream to travel or study abroad in university. Paris would definitely be one of my top picks. You look like you had a lovely time! These bubble-top brioches are so adorable! I loved this post, Patty. Such stunning photos of your brioche and of Paris…I almost felt transported! Wishing you and yours a very Happy Thanksgiving, my friend! It's great to have you back, Patty! Your brioche looks fantastic! You have inspired me to make this for the holidays whether it is on the FFwD schedule or not. Thank you for sharing your weekend in Paris. Love all the beautiful photos! Loved this post, Patty! Beautiful pics, beautiful brioche. I'm so glad you're back! The brioche look perfect and they are such a good fit with your pictures and stories from Paris. I hope you've had a wonderful holiday weekend so far. Beautiful photos (of both the clover rolls AND Paris)! A great choice for the “cook” – they matched your adventures perfectly. I feel like I just took a little jaunt to Paris after reading your post, and seeing your photos. Thanks so much for sharing! The Brioche looks like it could melt in your mouth. And the photos, well I'm definitely Pinning those! Great idea for shaping brioche without going through the trouble of making a tete. Must be a deliciously buttery addition to your Thanksgiving menu! Welcome back! Welcome home!! Those macarons look positively divine. What a treat! Gorgeous photos as well. I so enjoyed following you around Europe on FB and I'm looking forward to seeing more photos here on your blog. And the Brioche?? Wow! You are pulling at my heart there!! Hi, Patty! I've missed you! Your rolls look perfect – so do your pictures of Paris! I'd love to have the name of your favorite hotel. The last time I was there, I stayed on the Ile St. Louis and loved it. The brioche looks so great. As do your photos of Paris. I've never had macarons from a real bakery but they do look great. Your brioche looks perfect! And I love your photos of Paris! Hope your Thanksgiving was wonderful! Glad your back! I love these three buns brioche! i was planning of making monkey bread in a muffin pan. Thanks for sharing some photos from your Paris weekend. So beautiful! It sounds like you have a great time in Paris when you go! The falafel looks great!! So do your rolls! I wish I would have thought to make these too! Patty your rolls are so beautiful! And thanks for sharing pictures from your trip! Sounds like you had a wonderful time! I have been wanting to try those rolls too! It's been almost a year since I last made brioche, so it's time. I love your Paris pictures – they bring back the memories.